SANMYRS® just taking off as an innovative name in Pakistan’s digital printing industry with its quality inkjet printing inks having range of Reactive, Acid, Disperse & Eco – Solvent inks. SANMYRS® is the combination of research, knowledge, experience and professionalism with continual investment of time and efforts in cutting edge inkjet technology. SANMYRS® is the exceptional production of INKJET inks with Japanese innovation in quality and unique printability, resulting in a consistent printing process with almost no head clogging, printing excellent colors and fulfilling all market demands with optimal performance for every inkjet printing situation. No matter which generation of Epson print heads, SANMYRS® Inks perfectly fit the production conditions. Tonal value stability, transparency, neutral grey balance and superior color brilliancy will deliver perfectly flawless and high-quality performance in the printing process. Innovation is the key to keep pace with the ever-changing printing in textile and graphics industry. Inkjet Printers get faster, formats and circulations keep getting bigger and the demand for environment friendly products is rising. SANMYRS® is aware of its responsibility and develops new products through continued research for further improvements. SANMYRS® inks are well established as the standard setting range that delivers across the widest color spectrum. These inks are exemplary in their durability and longer shelf life especially under rare extreme conditions. When the other inks in the market reach their limit, particularly with some specific high performance requirements, SANMYRS® provides the solution with comfort. SANMYRS® inks are built to last regardless of the wear and tear they are often subjected to as can be seen by all the segments they serve. Furthermore, they are completely compatible with any Epson head printers in the market like Mutoh, Mimaki, Roland, Atexco, DGI and so on. Color gamut, brilliance, and excellent transfer effects are available from SANMYRS® range. Over the years, demand of inkjet textile printing has multiplied several times which required every print house to enhance its production capacity to maintain the growing demand. As a matter of fact whenever production and supply is enhanced per unit cost goes down which is normal in conventional textile printing. However, in digital printing the unit cost of printing one meter is not very much different than the unit cost of printing 1000 meters due to certain technical reasons. The standard customer is not very much interested to know the facts but his focus is to reduce per unit cost when the quality increases creating a complicated situation between the vender and buyer Digital textile printing is divided in two big sectors direct & transfer printing where Reactive, Acid & Disperse printing process are being done directly on fabric but sublimation process through direct & transfer printing on textile. 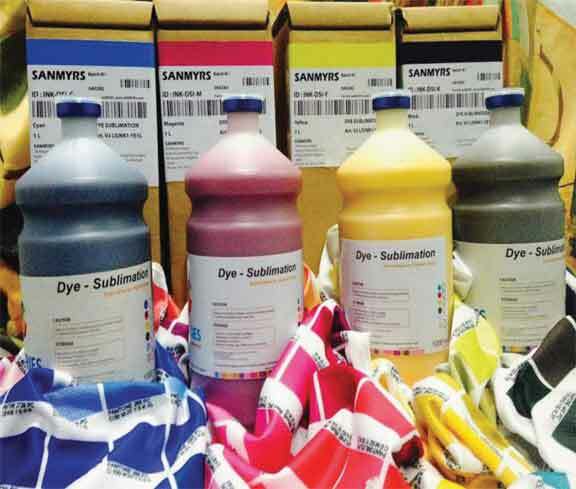 In the first phase, SANMYRS® has launched the Dye-Transfer ink Series designed for sublimation printing on sportswear, soft signage, fashion apparel and home textiles on wide format printers like Mimaki, Mutoh, or Roland type that are compatible with the ink set. They are available in CMYK, light cyan, and light magenta including Fluorescent Yellow & Fluorescent Magenta and boast an extended color gamut and unsurpassed printability ideal for longer print runs. SANMYRS® Dye-Transfer ink performs well by transfer or direct printing process on both coated and uncoated polyester media. Proper thermofixation of color utilizing a heat presses / calendar is necessary. SANMYRS® Dye Transfer provides an ideal correlation between color gamut and outdoor durability; thus being perfect for the large format signage industry. Digital Inkjet sublimation printing has become one of the most important textile production printing technologies and is, in fact, transforming the entire industry. It has been influencing new workflows, business plans and creative processes. Incidentally there have been many ways to transfer the printing result on to the garment or other substrates, and Sublimation is one of the optimum means for that. The sublimation process enables almost any design to be produced with a color and clarity not seen before. This exciting and unlimited process adds a new dimension to the fashion & sporting apparel. Digital printing using the latest sublimation techniques will result in superior products. Using quality polyester fabric which has been Wick Treated to draw moisture away from the skin results in a garment which is cool, comfortable and quick drying. 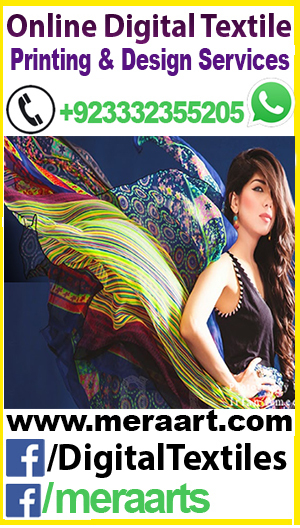 This entry was tagged digital dyes Pakistan, Digital Inkjet Sublimation, Digital printing dyes, Digital printing inks, Digital textiles Ink, Digital textiles Sublimation, digital Dye Ink, Digital Sublimation. Bookmark the permalink.